He later expanded his coaching repertoire to include women’s and men’s volleyball. In 1989, his Sabino girls’ volleyball team won the state championship with a perfect 22-0 record, while the 1997 team was state runners-up (22-2). 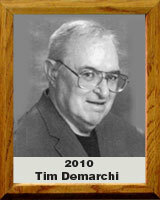 From 1972-96, Demarchi fashioned a 348-202 record as head basketball coach at Sabino. His 1993 team lost in overtime to Sunnyside in the state championship game. The 1996 team suffered an overtime loss to Prescott High in the state semi-finals. Demarchi was named 4A Volleyball Coach of the Year by the Arizona Daily Star in 1989 and 1997, and the same honor by the Tucson Citizen in 1989, 1992, 1993, and 1996. Demarchi closed out his coaching career as boys’ freshman basketball coach at Palo Verde High (1996-2001).